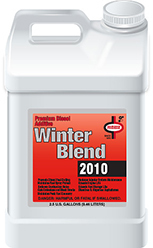 Winter Blend (WB) 2010 is a Premium Select™ winterized premium diesel additive (PDA) which imparts high performance qualities to diesel fuel. WB 2010 provides Premium Diesel qualities to standard diesel fuels in terms of detergency, stability and lubricity. In addition, it contains an anti-gel additive to improve cold temperature operability.